Gorham's Brittany Desjardin contributed eight points to her girls' victory. PORTLAND—Gorham seemed to suffer a bit of an identity crisis this winter when they hit a mid-season skid and dropped four games in a row – the program’s first losses in more than two years. By playoffs, though, the Rams clearly knew who they were: First, the team shocked No. 1 South Portland 53-42 in the semis; then – on Friday afternoon, Feb. 23 – they did the same to No. 2 Scarborough. As they had vs. the Red Riots, Gorham powered to a huge lead in the first half vs. the Red Storm – a crushing lead, in fact: an insurmountable lead. By contest’s end, the Rams stood on top 48-27. Scarborough held the upper-hand in the very early going on Friday. Sophie Glidden kicked things off with a Storm three. Gorhamite Michelle Rowe responded with a driving layup, but Isabella Dickinson made it 6-2 on another Scarborough downtowner. The Rams then evened things up on Holmes and Adele Nadeau buckets. Dickinson sank another two, but Gorham next broke into a run – a relentless, 21-0 assault that extended well into the second. Brittany Desjardin began it with a three; Holmes hashed a pair from the line; Nadeau hit a three and Olivia Michaud a two. Desjardin added another two after grabbing a long feed and holding up momentarily while a hot-on-her-heels defender careened passed. As the first wound down, Courtney Brent turned a Rams steal and dished to Desjardin, who delivered a buzzer-beater drive for two more. Michaud and Brent knocked down back-to-back threes for the Rams as the second dawned. Then, finally, Scarborough scored again – Julia Freeman did the honors, basketing from beyond the arc – but Gorham were simply off and running, and not about to look back. The Storm managed to match the Rams in both the third and fourth: The teams tallied eight apiece in the former quarter and seven in the latter. While Glidden, Dickinson, Madison Blanche, Jocelyn Couture, Emily Jeffords and Lindsey Kelley all reeled in points for Scarborough in the downhill half, Holmes, Desjardin, Nadeau, Rowe and Brent all contributed for the Rams, as did Jacqui Hamilton and Tatyanna Biamby. A bit of a misperception perhaps entered the public consciousness when the Rams began losing, midway through the regular season. Superstar Emily Esposito had led the team in recent years, but was off to college now. 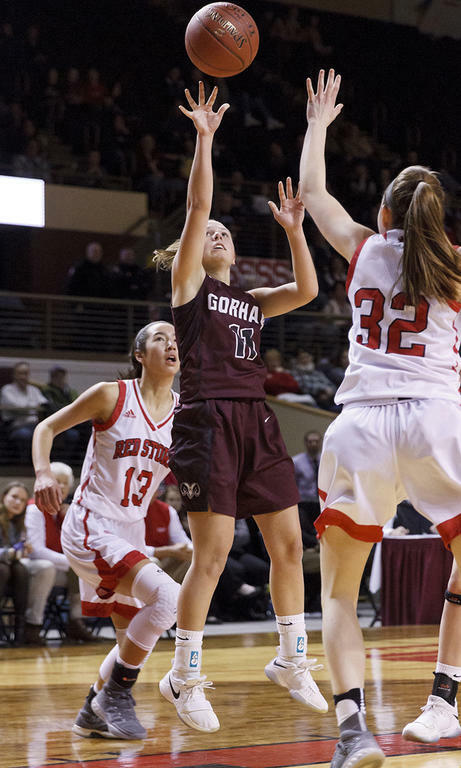 As Gorham’s L column ratcheted from zero, to one, to two and so on, it’s likely many began to question whether the Rams could still battle at the top. And, given that Esposito and Holmes had long formed such a formidable outside-inside combination threat, the possibility that Gorham might have become a one-trick pony – well, it seemed a real danger to their chances. But the Rams are experienced; they’ve been on the big stages and they know how to win there. Moreover, they’re expertly coached, and their bench remains deep. The addition of new talent like Nadeau and Michaud only bolsters an already-impressive roster. Clearly, rumors of the Rams’ demise are wildly premature. In the end, Scarborough failed to gain much ground on Gorham, and the Rams proved, for all of Southern Maine to see, that they’ve still got what it takes. And for that, they earned a trip to next Saturday, March 2’s State Final. It’ll be the Rams’ third trip to the big game in as many years; they brought home the gold ball in both 2016 and 2017. Nadeau accrued the game-high, with 12. Desjardin and Holmes dropped in eight apiece, Michaud seven, Rowe and Brent four each, Hamilton three and Biamby one. Glidden logged the Storm’s biggest output, with nine. Gorham advanced to 14-7 with the victory. When the Rams met Scarborough in the regular season, they prevailed 66-53. Next weekend, Gorham will rematch with Edward Little, whom they defeated two years ago for the title. The Rams took the teams’ regular season bout 48-36. Gorham’s Brittany Desjardin contributed eight points to her girls’ victory. Adele Nadeau, Gorham freshman standout, clashes with a pair of Storm defenders. Mackenzie Holmes battles a Red Stormer in midair. Gorhamite Jacqui Hamilton dishes the ball. Michelle Rowe and Mackenzie Holmes hug following the Rams’ win. The Gorham girls rejoice immediately following their victory over Scarborough. Mackenzie Holmes celebrates atop the ladder after the Rams’ victory over the Storm. The Rams pose as a team with their new plaque. The Gorham girls hoist the newest addition to their trophy case. Michelle Rowe works the baseline perimeter for Gorham vs. Scarborough.